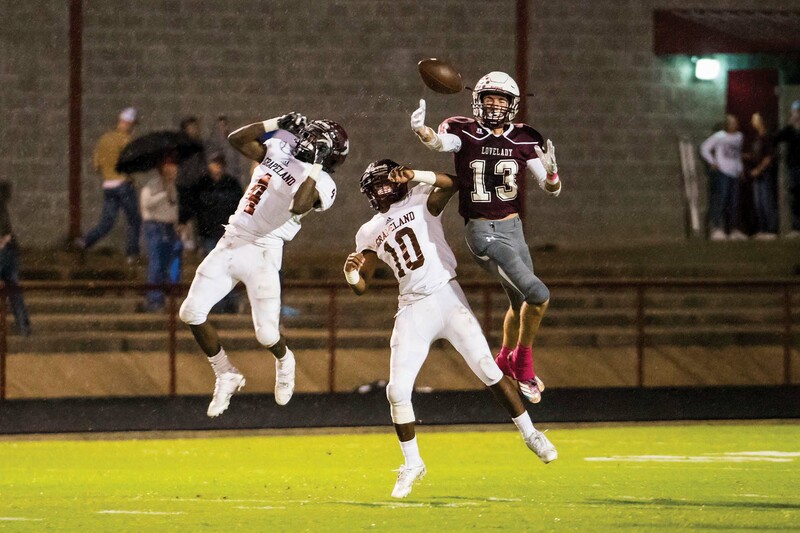 LOVELADY – In a pivotal matchup of top-10 teams, the Grapeland Sandies were able to use a monster half from senior Bear Ackley, to lift themselves past the Lovelady Lions on Friday night. Ackley accounted for all three of the Sandies first half touchdowns as Grapeland jumped out to a 20-6 lead in the first half, and would hold on for the 26-20 victory in Lovelady. Ackley put the Sandies on the board early, scoring each of the Sandies first two touchdowns. The first came on a monster 75-yard reception when senior quarterback Rick Frauenberger connected with fellow senior Ackley to give the Sandies an early lead. Ackley struck again shortly after, dashing into the end zone from 60-yards out to give the Sandies a 14-6 lead going into the second quarter. The senior wasn’t done there, as he would add a three-yard touchdown run just before the end of the half to give the Sandies a 20-6 advantage over the hosting Lions. While Ackley’s heroics were big, the play of the game may have come in the second half when freshman linebacker Cadarian Wiley recovered a fumble and returned it for a touchdown. This play would prove to be the difference in the game, as the six points earned would be the final margin of victory. Lovelady wasn’t a pushover in the loss. After falling into a 14-0 hole the Lions would begin to claw their way back into the game. The Lions lone score in the first half come via a six-yard touchdown run by Tim Johnson. It was the second half adjustments by the Lions that would make the game interesting. With wet field conditions, Lovelady would begin to chip away with a physical ground attack. After the scoop and score for the Sandies to make it a 26-6 score, the Lions would go back to work with Johnson again getting Lovelady into the end zone, this time from 10 yards out. After a successful two-point conversion, the Lions cut the deficit to 12. Greyson Bachynsky broke into the end zone for the Lions later, making the score 26-20, but Lovelady was unable to convert on the two-point conversion again. This would be the Lions final score of the night, as the Sandies defense was able to clamp down in the final quarter and secure the victory. The victory opens the door for the Sandies to claim their first outright district championship in 20 years, when the Sandies finished the regular season 9-0 and district champions. The Sandies have clinched at least a share of their district title, their first since 2008. Grapeland will have their scheduled bye week before returning to action next week against the West Hardin Oilers. Lovelady will hit the road to face those same Oilers this week in a game that can give the Lions separation for the second seed going into the playoffs. For a preview and recap of all the area action, check back in The Messenger.